In chapter of until now, we have talked about mold and bacteria. In this chapter, we would like to describe how to be possible of the mold. Many invisible mold spores are flying in the air. And, mold can attach to everything. under Suitable Condition for mold. As these grow and become big,the bag of spore is made and it becomes visible. 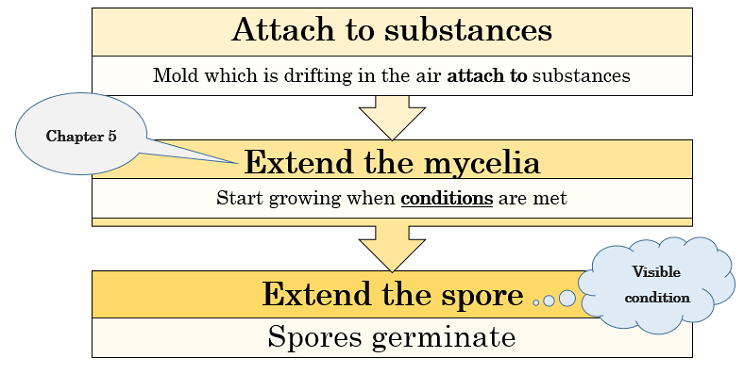 In this way, the mechanism of mold generation is surprisingly simple. In the next chapter,we will explain "Suitable Conditions".